Your baby is probably the best gift to ever have. But baby care is totally different. Taking care of your baby is one of the most difficult things to do. You need to put effort into putting them to sleep. You always need to be ready for nursing and always be prepared for throw-ups, messies and nasties. Especially nasties. You would need plenty of help regarding that. And one of the things you need to do is change your baby’s diaper. So where do they go? You need to find the best way of disposing it. That’s where a diaper trash comes in. We are already familiar with the best diaper pails in the market. But we know you need to expand your options and see what really the most suitable diaper pail is for you and your baby. In this diaper pail review, you get to understand the functions of a diaper trash and mostly to understand and broaden your options. You might like how we compare Ubbi vs Diaper Genie review. That way, you’re worries about choosing the right one will be firmer. There are plenty of ways to dispose your baby’s dirty diaper but using the right method of disposal is both healthy for you, your baby and the environment. But before going into the detail of talking about the best diaper pails, you must understand that you need to wrap and dispose diapers well too. You should never leave poop inside the diaper. You should drop the poop down the toilet and flush it. Never wrap poop inside the diaper because it becomes a biohazard. Now, let’s talk about the Top 5 Best Diaper Pails in the Market. 15 x 10.8 x 22.5"
22.2 x 13.5 x 9.5"
The Playtex Diaper Genie Complete Diaper Pail is ranked as the favorite all-time diaper pails in the market. It has a simple three word system and those words are ODOR-LOCK SYSTEM. The Diaper Genie essentials are actually made to lock-in the nasty odor of dirty diapers. Dirty diapers are extremely difficult to handle. They are nasty and they really dig deep into the nostrils. I mean, think about it, you’re already sour with the stink of your baby doing the doodoo dance. How much more if you have to deal with an entire batch dirty diapers in your midst? Now, isn’t than one great annoyance? It’s a great relief to get an odor lock-in feature where you won’t have to worry about that uncompromising scent anymore. It’s great to keep around because even if you keep it in an enclosed space, you can barely smell anything. This diaper garbage comes in five different colors: blue, pink, white, green and gray. At least you can choose which color fits your nursery the best. It is also very chic with its slick modern design. It doesn’t have dangerous edges that would hurt your baby or toddler when they start running around. And also, it is pretty light so if it does tip over, it won’t hurt anybody not even your baby. You might also like the fact that it is really easy to use. You can hold your baby and open the diaper trash at the same time. You only need one hand to throw that diaper away. 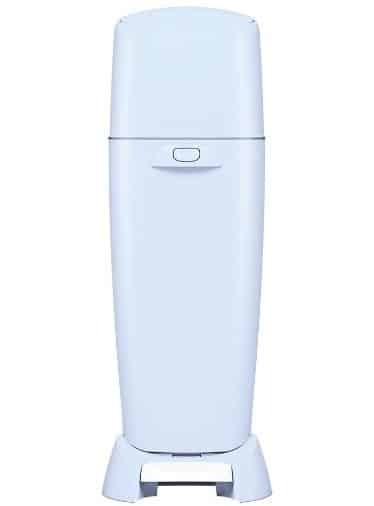 Unlike other diaper genie diaper pails, the Playtex diaper genie complete has a foot pedal. It also has its own trash bag that is cured to be antimicrobial. The refill packs are also shaped to be easily removed without you ever touching a single diaper. You can simply pull out the diaper trash sausage filled with dirty poop and straight to the trash it goes. The clam shut opening of this diaper trash can is pretty handy because it contains a carbon filter that absorbs the smell. That way, you won’t have the need to buy fragrances for your pails or dump huge amounts of baking soda or charcoal. It has more features to look forward to, so check it out. It may be difficult to choose the best Diaper pail for your nursery but it can be more confusing yet entertaining to shop for a cute design that fits your nursery’s motif. We’re pretty sure you can easily get the right color of diaper trash for your baby’s room because there are so many colors available by Ubbi Steel Diaper Pail. Because it is steel, it isn’t porous so the smell of the dirty diapers won’t seep through the steel. In addition, it has a rubber lock that seals the smell within. It’s a wonderfully crafted diaper pail with powder coated steel and rubber seal lock to lock-in the odor of that hammering diaper smell. Ubbi diaper pail bags can be anything from kitchen trash bags to other bags for other brands will fit well with this diapers trash can. You might also love the fact that it is childproofed. It’s also lovable that this Ubbi Steel Diaper Pail has an innovative locking system. It uses a sliding lid so that you won’t hassle yourself with opening a lid and keeping the lid open so you can dump the diaper well through. Another great Ubbi diaper pail reviews mentioned are from different institutions that have loved and even awarded this awesome diaper trash. Ubbi Steel Diaper Pail has received multiple Prestigious Awards to testify that the Ubbi Steel Diaper Pail is at top quality. Who wouldn’t especially if it can hold about 50 diapers at a time without having much odor to present? What’s also wonderful about this diaper trash cans selection is that it is the perfect size for any space. It is has quite a number of storage but it isn’t so wide that it would interfere with any space that’s meant for other more important baby essentials in your nursery. However, there are also other things to consider, since it has a rubber seal, it can trap the plastic bag and rip it when it’s time to pull it out for replacements. Also, it may rust if kept in humid conditions, so we're placing this at the second spot. Who wouldn’t want a diaper pail that looks so much like R2D2? I mean, come on! A robot looking diaper pail quietly sitting in your nursery room? It’s one great feature to look at. What’s also so great about this diaper trash can is the price! Diaper Pails aren’t really a necessity but it is very handy to have around. It keeps dirty diapers segregated from the rest of your trash and it is well kept and odor-sealed. The Diaper Champ Deluxe is an equipment you would love to keep around because it is the best price for your baby’s room. It is also economical because even if it has its own preferred diaper bag, it can still work well with kitchen trash bags. It effectively keeps the smell away but not enough to completely eliminate the odor. But still, it is a good and easy storage for you to use and keep in hand. It’s also handy because it has an easy open lock to quickly drop a dirty nappy in. It is really great that it can hold up to 30 diapers at a time. It also comes with a handle so you can bring it with you without having to worry about running to the nursery room every time you change a diaper. There are issues you have to deal with every diaper garbage can, be careful and wrap the diaper well so you won’t get crap smeared on the opening of your diaper pail. Since the Diaper Champ Deluxe has a smaller opening, it will definitely get poop around the lid if you’re not careful. You should also consider the fact that 30 diapers can weigh up to 20 pounds, it can really damage your diaper pail handle if you pull on the diaper trash too hard. It may be easy to keep throwing dirty diapers inside the diaper pail, but if you want optimal odor-free diaper pails, then you may want to clean it from time to time between bag replacements. It may isolate the stink but whenever you open the pail, a wave of gruesome scent can really hit you hard in the face. It still a good choice though so it deserves to be in the middle of the list. Diaper pails are really long and don’t quite fit under the table. You always have to find the need to look for a suitable place for you to put it in. But not for the Dekor Diaper Pail. It was made to be kept easily because the size matters especially in smaller and more compact areas. The Diaper Dekor will work well if kept under or inside a diaper changing dresser. It’s ideal to keep you the diapers out of sight and out of nasal range. What’s great about the Dekor Diaper Pail is that it also contains the bad odor of the nasty diapers, which is exactly what diaper pails are meant to do. However, even if it contains the diaper well, it has a problem of condensation. It can get warm inside especially if fresh warm diapers find their way in the diaper trash and this will steam up and cause the undesirable wetness. It happens especially so with diaper Dekor since it is smaller. The size of the Dekor Diaper Pail can hold only about 18 diapers at a time. It is quite ideal because changing the diaper pail refill will help in keeping things fresher and less smelly. If you keep diapers clogged up for too long it has the tendency to warm up and smell even worse than expected. And for that reason, this diaper trash can holds little so that more frequent changes can reduce biohazard. It comes with a foot pedal so you won’t have to open the lid with your hands, however, the Dekor diaper pail classic doesn’t come with it. With the Classic version, you would have to manually open the lid by yourself but you can still do it with one hand. The newer Dekor Diaper Pail Plus has a foot pedal. The lid has a rubber seal to lock off the lid. It has a spring loaded trap door so that it can eat the diaper up and immediately shut back tight. What’s also so great about this is that it the plastic casing is anti-scratch. Now that’s one thing we would love. We don’t need to worry about our little one’s making unwanted scratches on the surface of our diaper garbage can. Yet another adorable and tiny diaper pail will really come in handy if you want those tiny bomb containers to be kept unseen. You don’t want any nose bombs seen by visitors in your nursery, do you? Well, we sure don’t and for that reason Tommee Tippee Simplee Diaper pail is really functional and does a really good job at being stored away. We love this diaper trash can because it is simple in design. It doesn’t take up much space and it also does a really good job at keeping the odor away. With its tiny size it can still hold up to two to three days amount of diapers which is about 18 diapers. That’s still quite an amount of nasty packs in one small diaper pail. In order to keep the smell locked inside the diaper pail, you need to push the diaper through the smart lid and then close. It is a markdown for the Simplee Diaper pail because you would need to get your hands dirty because you need to open the lid and put your hand inside the lid. It gets especially nasty if some poop got smeared around the lid. One great factor to this awesome diaper garbage is that its diaper film casing is treated to be antibacterial. It will keep microbes away and significantly reduce the smell of the dirty diapers. And because of the smart lock, you can pull the cartridge that supports the film. You can use the built-in cutter to cut off the film and use the next trash bag. It is relatively easy to change and refill the film. You just need to tie a knot at the end and install the cartridge. If you are going to replace the trash bag, you need to lift the cartridge and cut the plastic bag and tie a knot again. This a quick and easy refill that comes in really handy and helpful rather than pulling out the entire bag and putting one again. Diapers are essential for our babies but they can be one heck of a bomb if kept improperly. That’s what Diaper pails are made for, to secure dirty diaper and lock the odor in. they are also the best way to segregate the dirty nappies the easiest and quickest way possible. What is a Diaper Pail? Diaper pail is a trash can to collect soiled diapers. It helps to hold back the bad odours leaving the nursery fresh and hygienic. Whether it is necessary for your house or not; we would say "YES". Simply because it keeps away the odour and maintains hygiene of your family when it is not always possible to dispose the diapers on a daily basis. Why are Diaper Pails necessary? Diapers which contains pooh, if not properly disposed can become a biohazard.So extra care needs to be taken to dispose it. It is better if you could drop the pooh in the toilet, flush it and then dispose the diaper after properly wrapping it up. Diaper pails holds these diapers and locks in the bad odour to keep your nursery smelling fresh all the time. How does Diaper Pails work? Diaper pails have a built in odour lock system which locks in bad odour. Some pails sprinkle baking soda after each use while others use carbon filters which let air in but lock bad odour from getting out. How do you use Diaper Pails? It is used exactly in the same manner as a normal trash can. Some of them have sliders, some have foot pedal to lift the lid while others just need to be lifted with hand. Why do i need to use a liner for my Diaper Pail? The liner for the pails are designed to hold the diapers and prevent any kind of leak. It is completely leak proof and water proof. Also it has a drawstring to help you to pull it off and wrap it tight during refills. Are Arm and Hammer Diaper Pail bags economical? Well they do cost a lot over a period of time, but definitely does the job. Your room stinks less and you don't need to touch the dirty diapers while refilling the pail. Can i use normal garbage bag or grocery bag for diaper pails? Well you could but it may not be fit for purpose. Some liners are strong and can hold the diapers, but some just give away after a while. They also don't help to lock in the bad odour. Whereas Diaper Pail liners are built for purpose and works best to leave your nursery odour free. Can i use trash can as Diaper Pail? Unfortunately NO. Trash can cannot lock the bad odour and your house will soon be stinking with pooh. Can i use Diaper Pails for cloth diapers? Some of the Pails do allow the cloth diapers to fit through. But most commonly a wet hanging bag with a zipper a draw string is used for cloth diapers. What are hands free Diaper Pails? Diaper pails with a slide or a foot pedal where no effort is needed to open the lid of the pail is known as a handsfree diaper pails. How long do the diaper pails last? They are meant to go for many many years as long as the lid is working fine to keep the odour in. Do Diaper Pails come in different sizes? yes they do. Right from a portable size to large, they are available in different sizes to suit your needs. Our recommendation would be to buy a medium sized pail and empty it frequently to maintain a good hygiene around your little one. Are there any reusable Diaper Pail Liners available in the market? Yes there are. you could either buy a washable liner for your pail or a washable wet hanging bag to collect the soiled diapers. Where can i buy Diaper Pails? You could buy them in store or in any of the trusted online retailers like Amazon. Do not forget to read our in-depth review about diaper pails before choosing yours.